Sorting of data can be integral part of processing the given input to produce required output. Sorting may be required to remove data objects which are far from the mean of the entire data. Currently there are many sorting techniuqes, those are used according to the size of the data and the purpose of sorting. 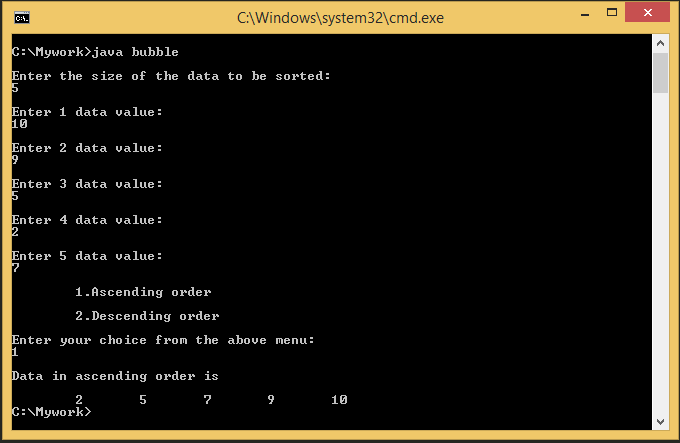 The basic of all sorting techniques is Bubble sort. How it works: Instead of searching entire array, it compares only the adjacent data elements. It continues it’s searching till the last of the array and after reaching end of the array, it searches for the next largest number in the array and this process continues for n times where n is the size of the array. This entry was posted in Java and tagged algorithm for bubble sort, bubble sort algorithm, bubble sort ascending order, bubble sort descending order, bubble sort example in java, bubble sort in java example, bubble sort in java pdf, bubble sort in java using array, bubble sort in java using arraylist, bubble sort java source code, bubble sort using java, bubblesort java, java program for bubble sort in ascending order, java program for bubble sort in descending order. Bookmark the permalink.